Definition at line 326 of file llfolderview.h. Definition at line 398 of file llfolderview.h. Definition at line 113 of file llfolderview.cpp. References FALSE, gColors, LLControlGroup::getColor(), LLViewerImageList::getImage(), LLResMgr::getRes(), LLControlGroup::getString(), gImageList, gResMgr, gViewerArt, LLFONT_SANSSERIF_SMALL, LLFONT_SMALL, mArrowImage, mBoxImage, MIPMAP_FALSE, refresh(), setIcon(), LLUICtrl::setTabStop(), sFgColor, sFilterBGColor, sFilterTextColor, sFont, sHighlightBgColor, sHighlightFgColor, sSmallFont, and TRUE. Definition at line 163 of file llfolderview.cpp. References mArrowImage, mBoxImage, mListener, and NULL. Reimplemented in LLFolderViewFolder, and LLFolderView. Definition at line 381 of file llfolderview.h. Definition at line 380 of file llfolderview.h. Definition at line 379 of file llfolderview.cpp. References LLFolderViewFolder::addItem(), LLFolderView::addItemID(), FALSE, getListener(), and mParentFolder. Referenced by LLInventoryPanel::buildNewViews(), LLPanelInventory::createViewsForCategory(), and LLInventoryPanel::modelChanged(). Definition at line 312 of file llfolderview.cpp. Definition at line 393 of file llfolderview.cpp. References getIndentation(), getItemHeight(), LEFT_INDENTATION, llmax(), mIndentation, mLabelWidth, and mParentFolder. Referenced by LLFolderView::arrange(), LLFolderViewFolder::arrange(), and arrangeFromRoot(). Definition at line 330 of file llfolderview.cpp. References arrange(), getRoot(), height, S32, and width. Referenced by LLFolderView::doIdle(), LLFloaterNetwork2080::doIdle(), and LLPanelInventory::updateInventory(). Definition at line 545 of file llfolderview.cpp. Definition at line 464 of file llfolderview.cpp. References FALSE, mIsSelected, mListener, LLFolderViewEventListener::selectItem(), and TRUE. Definition at line 351 of file llfolderview.cpp. Referenced by LLFolderView::handleKeyHere(), handleMouseDown(), and handleMouseUp(). Definition at line 519 of file llfolderview.cpp. Referenced by LLInventoryPanel::modelChanged(), and LLInventoryPanel::rebuildViewsFor(). Definition at line 432 of file llfolderview.cpp. References getParentFolder(), mLastFilterGeneration, LLFolderViewFolder::setCompletedFilterGeneration(), and TRUE. Referenced by LLFolderViewFolder::addItem(), LLFolderViewFolder::dirtyFilter(), and refresh(). Definition at line 803 of file llfolderview.cpp. References ARROW_SIZE, LLViewerImage::bindTexture(), bottom, LLFontGL::BOTTOM, clamp_rescale(), LLView::drawDebugRect(), f, FALSE, LLInventoryFilter::getCurrentGeneration(), LLFolderView::getDebugFilters(), LLFolderView::getFilter(), getFiltered(), LLFolderView::getFilterSubString(), LLRectBase< Type >::getHeight(), LLFocusMgr::getKeyboardFocus(), LLFontGL::getLineHeight(), getRoot(), LLFolderView::getSelectionFadeElapsedTime(), LLFolderView::getShowSelectionContext(), LLFontGL::getWidth(), LLRectBase< Type >::getWidth(), LLFontGL::getWidthF32(), gFocusMgr, gl_draw_image(), gl_draw_scaled_rotated_image(), gl_rect_2d(), gl_segmented_rect_2d_tex(), glColor4fv, LLFolderViewEventListener::hasChildren(), hasVisibleChildren(), ICON_PAD, ICON_WIDTH, LLFolderViewEventListener::isUpToDate(), left, LLFontGL::LEFT, llfloor(), llround(), mArrowImage, mBoxImage, mControlLabelRotation, mDragAndDropTarget, mIcon, mIndentation, mIsCurSelection, mIsSelected, mLabel, mLabelStyle, mLabelSuffix, mLastFilterGeneration, mListener, LLView::mRect, mRoot, mStatusText, mStringMatchOffset, LLColor4::mV, LLFontGL::NORMAL, LLPointer< Type >::notNull(), LLFontGL::renderUTF8(), right, S32, S32_MAX, LLView::sDebugRects, sFgColor, sFilterBGColor, sFilterTextColor, sFont, sHighlightBgColor, sHighlightFgColor, sSmallFont, TEXT_PAD, top, TRUE, VALPHA, and y. Definition at line 428 of file llfolderview.h. Definition at line 356 of file llfolderview.cpp. References LLFolderView::extendSelection(), getRoot(), and NULL. Referenced by handleMouseDown(), and handleMouseUp(). Definition at line 408 of file llfolderview.cpp. References getRoot(), LLView::getVisible(), llformat(), mLastFilterGeneration, mListener, mParentFolder, mStatusText, mStringMatchOffset, and setFiltered(). Referenced by LLFolderViewFolder::filter(), and filterFromRoot(). Definition at line 320 of file llfolderview.cpp. Definition at line 475 of file llfolderview.h. Definition at line 250 of file llfolderview.cpp. Definition at line 245 of file llfolderview.cpp. References LLFolderView::getFilter(), LLInventoryFilter::getMinRequiredGeneration(), mFiltered, mLastFilterGeneration, and mRoot. Referenced by LLFolderView::arrange(), LLSelectFirstFilteredItem::doFolder(), LLOpenFilteredFolders::doFolder(), LLFolderView::doIdle(), LLSelectFirstFilteredItem::doItem(), LLOpenFilteredFolders::doItem(), draw(), LLFolderViewFolder::filter(), and potentiallyVisible(). Definition at line 497 of file llfolderview.h. Referenced by arrange(), LLFolderView::scrollToShowItem(), and LLFolderView::startRenamingSelectedItem(). Definition at line 451 of file llfolderview.h. Definition at line 401 of file llfolderview.cpp. References LLFontGL::getLineHeight(), ICON_PAD, llmax(), llround(), mIcon, S32, and sFont. Referenced by LLFolderViewFolder::arrange(), and arrange(). Definition at line 472 of file llfolderview.h. Definition at line 412 of file llfolderview.h. Referenced by LLFolderViewFolder::filter(), and potentiallyVisible(). Definition at line 605 of file llfolderview.cpp. Referenced by LLFolderView::addFolder(), LLFloaterNetwork2080::addNode(), LLFolderViewFolder::addToFolder(), addToFolder(), LLInventoryFilter::check(), LLFolderViewFolder::destroyView(), LLOpenFolderByID::doFolder(), LLSaveFolderState::doFolder(), doToSelected(), LLFolderViewFolder::extractItem(), LLBeginIMSession::handleEvent(), LLInventoryPanel::modelChanged(), LLInventoryPanel::openSelected(), LLItemBridge::performAction(), LLFolderView::removeSelectedItems(), LLFloaterNetwork2080::requestChildren(), LLFloaterNetwork2080::selectionCallback(), LLInventoryPanel::setSelection(), and LLFolderView::startRenamingSelectedItem(). Definition at line 591 of file llfolderview.cpp. References LLFolderViewEventListener::getName(), mLabel, and mListener. Referenced by LLFloaterNetwork2080::addNode(), LLFolderView::removeSelectedItems(), and LLFolderView::startRenamingSelectedItem(). Definition at line 191 of file llfolderview.cpp. References LLFolderViewFolder::getNextFromChild(), LLView::getVisible(), mParentFolder, and NULL. Referenced by LLFolderView::handleKeyHere(), LLFolderView::removeSelectedItems(), and LLFolderView::search(). Definition at line 445 of file llfolderview.h. Definition at line 600 of file llfolderview.cpp. Referenced by LLFolderViewEventListener::arrangeAndSet(), LLFolderView::autoOpenItem(), dirtyFilter(), LLOpenFoldersWithSelection::doFolder(), LLSelectFirstFilteredItem::doFolder(), LLOpenFilteredFolders::doFolder(), LLOpenFoldersWithSelection::doItem(), LLSelectFirstFilteredItem::doItem(), LLOpenFilteredFolders::doItem(), LLFolderView::handleKeyHere(), LLInventoryPanel::modelChanged(), LLFolderViewFolder::recursiveDeselect(), recursiveDeselect(), LLFolderView::removeSelectedItems(), LLFolderViewFolder::removeView(), LLFolderView::sanitizeSelection(), and LLFolderView::setSelection(). Definition at line 213 of file llfolderview.cpp. References LLFolderViewFolder::getPreviousFromChild(), LLView::getVisible(), mParentFolder, and NULL. Definition at line 171 of file llfolderview.cpp. Referenced by LLFolderView::arrange(), LLFolderViewFolder::arrange(), LLFolderViewEventListener::arrangeAndSet(), arrangeFromRoot(), changeSelectionFromRoot(), LLFolderViewFolder::destroyView(), LLSelectFirstFilteredItem::doFolder(), LLSelectFirstFilteredItem::doItem(), LLFolderViewFolder::draw(), draw(), extendSelectionFromRoot(), LLFolderViewFolder::extractItem(), LLFolderViewFolder::filter(), filter(), filterFromRoot(), LLFolderViewFolder::handleDragAndDrop(), LLFolderViewFolder::handleDragAndDropFromChild(), handleHover(), LLFolderView::handleKeyHere(), handleMouseUp(), LLFolderView::handleUnicodeCharHere(), LLInventoryPanel::modelChanged(), LLFolderViewFolder::potentiallyVisible(), potentiallyVisible(), LLFolderViewFolder::removeView(), LLFolderView::sanitizeSelection(), and setSelectionFromRoot(). Definition at line 586 of file llfolderview.cpp. Referenced by LLInventoryFilter::check(), and LLFolderView::search(). Definition at line 434 of file llfolderview.h. Definition at line 373 of file llfolderview.cpp. Definition at line 368 of file llfolderview.cpp. Definition at line 363 of file llfolderview.cpp. Definition at line 723 of file llfolderview.cpp. Definition at line 768 of file llfolderview.cpp. References ACCEPT_NO, ACCEPT_YES_MULTI, LLFolderViewEventListener::dragOrDrop(), FALSE, LLFolderViewFolder::handleDragAndDropFromChild(), lldebugst, llendl, mDragAndDropTarget, mListener, mParentFolder, and TRUE. Definition at line 658 of file llfolderview.cpp. References FALSE, gAgent, LLAgent::getInventoryRootID(), getRoot(), LLFolderViewEventListener::getUUID(), gInventory, gInventoryLibraryRoot, gToolDragAndDrop, gViewerWindow, LLToolDragAndDrop::handleHover(), LLView::hasMouseCapture(), isMovable(), LLInventoryModel::isObjectDescendentOf(), LLToolDragAndDrop::isOverThreshold(), LLView::localPointToScreen(), mListener, NULL, S32, LLViewerWindow::setCursor(), LLViewerWindow::setKeyboardFocus(), LLFolderView::setShowSelectionContext(), LLToolDragAndDrop::SOURCE_AGENT, LLToolDragAndDrop::SOURCE_LIBRARY, LLToolDragAndDrop::SOURCE_WORLD, TRUE, UI_CURSOR_ARROW, and UI_CURSOR_NOLOCKED. Definition at line 621 of file llfolderview.cpp. References changeSelectionFromRoot(), extendSelectionFromRoot(), FALSE, gToolDragAndDrop, gViewerWindow, isMovable(), LLView::localPointToScreen(), make_ui_sound(), MASK_CONTROL, MASK_SHIFT, mIsSelected, mSelectPending, S32, LLToolDragAndDrop::setDragStart(), LLViewerWindow::setMouseCapture(), setSelectionFromRoot(), and TRUE. Definition at line 738 of file llfolderview.cpp. References changeSelectionFromRoot(), extendSelectionFromRoot(), FALSE, getRoot(), gViewerWindow, LLView::hasMouseCapture(), MASK_CONTROL, MASK_SHIFT, mIsSelected, mSelectPending, NULL, LLView::pointInView(), LLViewerWindow::setMouseCapture(), setSelectionFromRoot(), LLFolderView::setShowSelectionContext(), and TRUE. Definition at line 611 of file llfolderview.cpp. References FALSE, make_ui_sound(), mIsSelected, setSelectionFromRoot(), and TRUE. Definition at line 729 of file llfolderview.cpp. References FALSE, LLView::getParent(), and LLView::handleScrollWheel(). Definition at line 453 of file llfolderview.h. Referenced by LLFolderView::draw(), and draw(). Definition at line 177 of file llfolderview.cpp. References FALSE, mParentFolder, and TRUE. Definition at line 495 of file llfolderview.cpp. References LLFolderViewEventListener::isItemMovable(), mListener, and TRUE. Definition at line 493 of file llfolderview.h. Definition at line 507 of file llfolderview.cpp. References LLFolderViewEventListener::isItemRemovable(), mListener, and TRUE. Referenced by remove(), and LLFolderView::removeSelectedItems(). Definition at line 447 of file llfolderview.h. Referenced by LLFolderView::addToSelectionList(), LLOpenFoldersWithSelection::doFolder(), LLSaveFolderState::doFolder(), LLOpenFoldersWithSelection::doItem(), LLFolderViewFolder::extendSelection(), LLFolderView::handleKeyHere(), and LLFolderView::removeSelectedItems(). Definition at line 553 of file llfolderview.cpp. Definition at line 238 of file llfolderview.cpp. References LLFolderView::getFilter(), getFiltered(), getLastFilterGeneration(), LLInventoryFilter::getMinRequiredGeneration(), and getRoot(). Definition at line 561 of file llfolderview.cpp. Definition at line 478 of file llfolderview.cpp. References FALSE, getParentFolder(), mIsSelected, and mNumDescendantsSelected. Referenced by LLFolderViewFolder::recursiveDeselect(), and LLFolderViewFolder::removeView(). Definition at line 271 of file llfolderview.cpp. 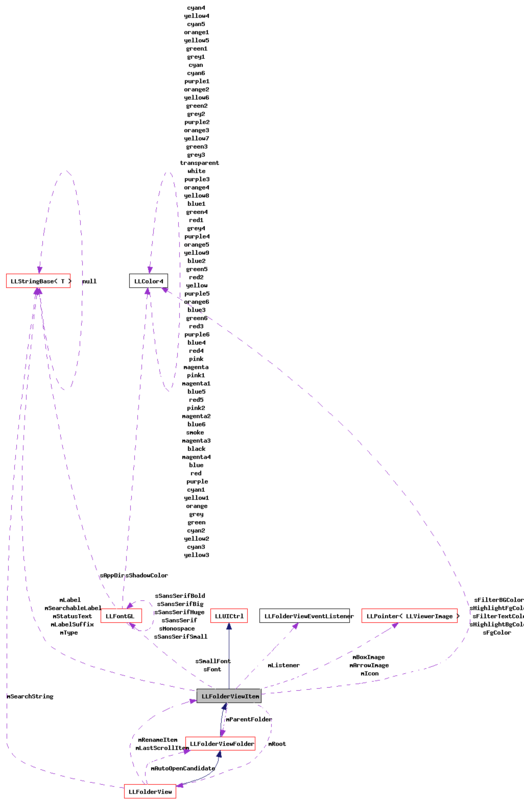 References ARROW_SIZE, dirtyFilter(), LLFolderViewEventListener::getCreationDate(), LLFolderViewEventListener::getDisplayName(), LLFolderViewEventListener::getIcon(), LLFolderViewEventListener::getLabelStyle(), LLFolderViewEventListener::getLabelSuffix(), LLFontGL::getWidth(), ICON_PAD, ICON_WIDTH, mCreationDate, mLabel, mLabelStyle, mLabelSuffix, mLabelWidth, mListener, mParentFolder, mSearchableLabel, LLFolderViewFolder::requestArrange(), S32, setIcon(), sFont, TEXT_PAD, and LLStringBase< char >::toUpper(). Referenced by LLFolderViewItem(), LLInventoryPanel::modelChanged(), and LLCallingCardBridge::refreshFolderViewItem(). Definition at line 531 of file llfolderview.cpp. References FALSE, isRemovable(), mListener, LLFolderViewEventListener::removeItem(), and TRUE. Definition at line 569 of file llfolderview.cpp. References mLabel, mListener, mParentFolder, LLFolderViewEventListener::renameItem(), and LLFolderViewFolder::resort(). Definition at line 255 of file llfolderview.cpp. Referenced by filter(), and LLFolderViewFolder::setFiltered(). Definition at line 261 of file llfolderview.cpp. Referenced by LLFolderViewItem(), and refresh(). Definition at line 449 of file llfolderview.h. Definition at line 491 of file llfolderview.h. Definition at line 447 of file llfolderview.cpp. Definition at line 343 of file llfolderview.cpp. Referenced by LLFolderViewEventListener::arrangeAndSet(), LLFolderView::finishRenamingItem(), LLFolderViewFolder::handleDoubleClick(), handleMouseDown(), handleMouseUp(), handleRightMouseDown(), LLFolderView::removeSelectedItems(), and LLFolderView::revertRenamingItem(). Definition at line 329 of file llfolderview.h. Definition at line 362 of file llfolderview.h. Referenced by draw(), LLFolderViewItem(), and ~LLFolderViewItem(). Definition at line 363 of file llfolderview.h. Definition at line 359 of file llfolderview.h. Referenced by LLFolderViewFolder::draw(), and draw(). Definition at line 343 of file llfolderview.h. Referenced by getCreationDate(), LLFolderViewFolder::getCreationDate(), and refresh(). Definition at line 361 of file llfolderview.h. Referenced by draw(), LLFolderViewFolder::handleDragAndDrop(), handleDragAndDrop(), and LLFolderViewFolder::handleDragAndDropFromChild(). Definition at line 356 of file llfolderview.h. Referenced by LLFolderView::filter(), LLFolderViewFolder::filter(), getFiltered(), LLFolderViewFolder::setFiltered(), and setFiltered(). Definition at line 353 of file llfolderview.h. Referenced by LLFolderView::arrange(), LLFolderViewFolder::arrange(), and hasVisibleChildren(). Definition at line 351 of file llfolderview.h. Referenced by draw(), getItemHeight(), LLFolderView::scrollToShowItem(), and setIcon(). Definition at line 354 of file llfolderview.h. Referenced by arrange(), draw(), getIndentation(), LLFolderViewFolder::handleDoubleClick(), LLFolderViewFolder::handleMouseDown(), and LLFolderView::LLFolderView(). Definition at line 347 of file llfolderview.h. Referenced by draw(), getIsCurSelection(), and setIsCurSelection(). Definition at line 346 of file llfolderview.h. Referenced by LLFolderViewFolder::changeSelection(), changeSelection(), draw(), handleMouseDown(), handleMouseUp(), handleRightMouseDown(), isSelected(), LLFolderViewFolder::recursiveDeselect(), recursiveDeselect(), LLFolderViewFolder::setSelection(), and setSelection(). Definition at line 339 of file llfolderview.h. Referenced by draw(), getLabel(), getName(), LLFolderView::LLFolderView(), refresh(), and rename(). Definition at line 349 of file llfolderview.h. Referenced by draw(), and refresh(). Definition at line 350 of file llfolderview.h. Definition at line 342 of file llfolderview.h. Referenced by arrange(), and refresh(). Definition at line 357 of file llfolderview.h. Referenced by dirtyFilter(), draw(), LLFolderViewFolder::filter(), filter(), getFiltered(), getLastFilterGeneration(), and setFiltered(). Definition at line 345 of file llfolderview.h. 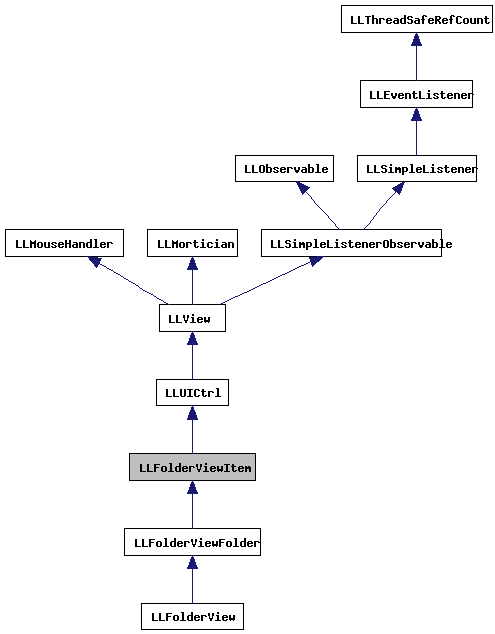 Referenced by LLFolderViewFolder::applyListenerFunctorRecursively(), applyListenerFunctorRecursively(), buildContextMenu(), LLFolderViewFolder::changeSelection(), changeSelection(), draw(), LLFolderViewFolder::filter(), filter(), getListener(), getName(), LLFolderViewFolder::getSortGroup(), LLFolderViewFolder::handleDragAndDrop(), handleDragAndDrop(), LLFolderViewFolder::handleDragAndDropFromChild(), handleHover(), LLFolderViewFolder::handleRightMouseDown(), LLFolderViewFolder::isMovable(), isMovable(), LLFolderViewFolder::isRemovable(), isRemovable(), LLFolderViewFolder::isTrash(), open(), preview(), refresh(), remove(), rename(), LLFolderViewFolder::setOpenArrangeRecursively(), LLFolderViewFolder::setSelection(), setSelection(), and ~LLFolderViewItem(). Definition at line 355 of file llfolderview.h. Referenced by LLFolderViewFolder::changeSelection(), LLFolderViewFolder::extendSelection(), getNumSelectedDescendants(), LLFolderViewFolder::recursiveDeselect(), recursiveDeselect(), and LLFolderViewFolder::setSelection(). Definition at line 344 of file llfolderview.h. Referenced by LLFolderViewFolder::addToFolder(), addToFolder(), arrange(), LLFolderViewFolder::destroyView(), destroyView(), filter(), LLFolderViewFolder::getNextFromChild(), getNextOpenNode(), getParentFolder(), getPreviousOpenNode(), handleDragAndDrop(), isDescendantOf(), refresh(), rename(), LLFolderViewFolder::requestArrange(), LLFolderViewFolder::setCompletedFilterGeneration(), and LLFolderViewFolder::setOpenArrangeRecursively(). Definition at line 360 of file llfolderview.h. Referenced by LLFolderView::arrange(), LLFolderViewFolder::arrange(), draw(), LLFolderViewFolder::filter(), getFiltered(), getRoot(), LLFolderViewFolder::hasFilteredDescendants(), LLFolderViewFolder::needsArrange(), and LLFolderViewFolder::potentiallyVisible(). Definition at line 340 of file llfolderview.h. Referenced by getSearchableLabel(), and refresh(). Definition at line 348 of file llfolderview.h. Definition at line 352 of file llfolderview.h. Referenced by LLFolderView::draw(), draw(), LLFolderViewFolder::filter(), and filter(). Definition at line 358 of file llfolderview.h. Referenced by draw(), and filter(). Definition at line 341 of file llfolderview.h. Definition at line 333 of file llfolderview.h. Referenced by draw(), and LLFolderViewItem(). Definition at line 336 of file llfolderview.h. Definition at line 337 of file llfolderview.h. Definition at line 331 of file llfolderview.h. Referenced by LLFolderView::draw(), draw(), getItemHeight(), LLFolderView::LLFolderView(), LLFolderViewItem(), refresh(), LLFolderView::scrollToShowItem(), and LLFolderView::startRenamingSelectedItem(). Definition at line 334 of file llfolderview.h. Definition at line 335 of file llfolderview.h. Definition at line 332 of file llfolderview.h. Referenced by LLFolderView::arrange(), LLFolderView::draw(), draw(), and LLFolderViewItem().